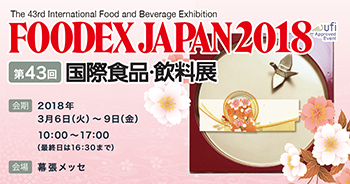 The 43rd edition of Foodex Japan, the International Exhibition of Food and Beverage, takes place from Tuesday 6th to Friday 9th march at the Makuhari Messe International Convention Complex in Chiba (Tokyo). The stand of Italy is the most reppresentative of the event. Opening hours from 10 am to 5 pm.